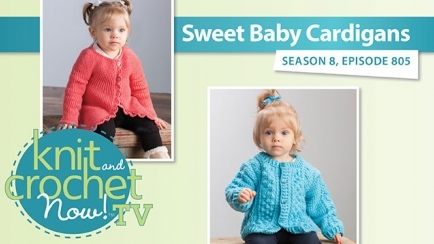 Join Lena as she knits a Sideways Baby Cardigan using a construction technique that’s a little different. Jenny will show how to crochet the wonderful texture of cables into a baby or toddler Aran Stitch Cardigan. In the technique corner, learn from Melissa how to make three kinds of crocheted ribbings. I love to knit and crochet baby items. I love the patterns and the clear directions from the instructors.